Starlings are a very common bird. They are similar in size to a black bird but have shorter tails. They can be seen in most gardens, parks and woodlands throughout Ireland. Starlings nest in a range of areas; from hollow trees to farm buildings. Quite often they will also nest in holes on roofs and in walls. They feed on a variation of foods ranging from insects to seed and fruit. When their nesting period is over starlings gather in large flocks and use communal roosting sites such as woodlands and forestry. These roosting sites can often accommodate many thousand birds, in autumn starlings can gather in such large groups that they can look like black clouds in the sky swooping, turning and diving in unison. This is known as murmuration and can be a spectacular sight. The agriculture and food industry in Ireland is of upmost importance especially in the present climate. Biosecurity, food safety and food safety awareness play a major role in ensuring that dangerous pathogens, toxins and contaminants do not find their way into the food chain. The result of something like this happening has serious implications; as we have seen from previous situations i.e. Foot and mouth outbreak, avian influenza and the pork dioxin scare. Starlings roosting or feeding in animal holding facilities such as barns, piggeries, poultry productions facilities, slatted units, feed lots and abattoirs can and do pose a serious biosecurity risk. Firstly starling faeces are known as a reservoir for a range of fungal and bacterial diseases, allergens and protozoan parasites. Also birds can contaminate animal feed by carrying pathogens such as bacterial disease (salmonella) from animal droppings on their feet and beaks. Starlings can then cross contaminate animal feed such as silage, grain or fodder. Don’t let starlings or other birds put your business or livelihood in jeopardy. Starlings are protected under the Wildlife Act 1976 and Wildlife (Amendment) Act 2000 and European-level legislation. Active nests cannot be moved until their deemed to be not active. Then work can commence, for more information go to nest removal. The best way to deal with starlings is to exclude them from the problem area. This is done with the use of bird proofing. Distress call Systems and visual deterrents are also viable options. 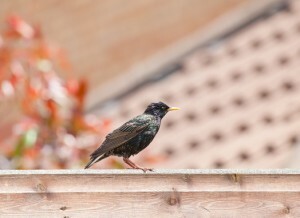 Wildlife Management Services have been providing starling control for the last 10 years and are experts in the field.